I’m making things cute this Easter. Not just a little cute, either. I’m making them A LOT cute. Because I have a 13 year old for whom things are less magical than they were before, and a 2 year old for whom things are just now getting magical. 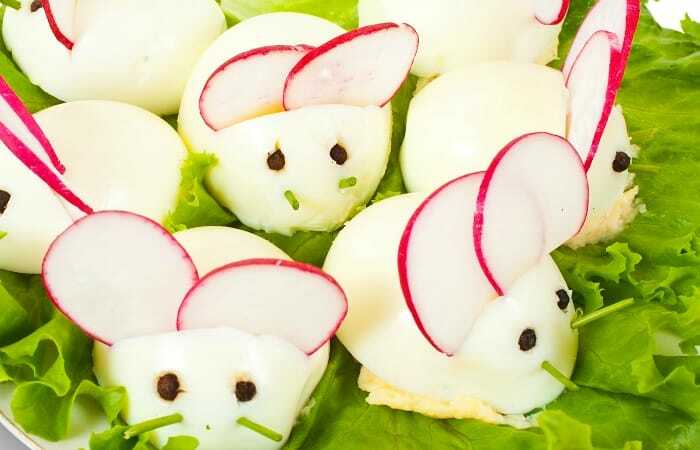 So, laugh at me or not, but this is How to Make Mouse Deviled Eggs. Because you know you want to make them now. If just to bite their little ears off…LOL! Something tells me that I might also be making these for Halloween. I mean, they’re adorbs for Easter. Not that I really understand why my brain has equated cute little mice with Easter, but Halloween? 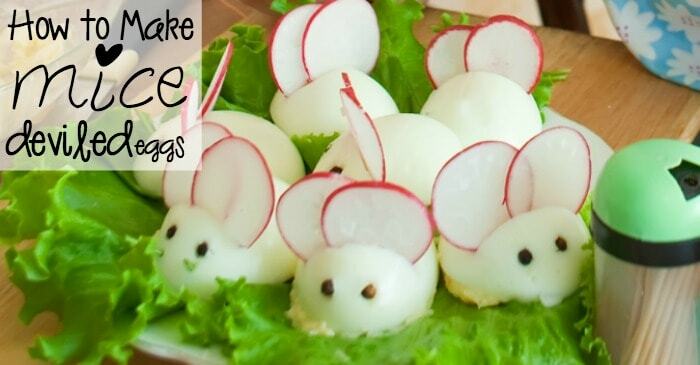 Yeah, we might have to call them Rat Deviled Eggs, then…LOL! Laugh at me or not, but this is How to Make Mouse Deviled Eggs. Because you know you want to make them now. If just to bite their little ears off...LOL! 6 to othpicks I wanted to use black, but only had green. So, there. LOL! Put eggs on to boil. Make sure you boil them for 15 minutes. The full 15 minutes at a rolling boil. That way they're cooked all the way through. While those are cooking, mix your mayonnaise, mustard, black pepper, and salt together in a medium mixing bowl. Set aside. Cut your toothpicks in half. Set aside. Slice the olive in half and, using your straw, poke little holes in the olive, using it like a cookie cutter to get a little round dot out of the olive. Cut 12 of these. Set aside. Thinly slice your radish into at least 12 slices. Set aside. Scoop the yolks out of the eggs and add them to the mayonnaise mixture. Smoosh the yolks completely as you are mixing them into the mayonnaise. Place a tablespoon of the mayonnaise mixture into the cavity of each egg half. On your platter, place the eggs cavity-down (yes, with the deviled part of the egg on the plate...messy, but true). Using a knife, cut a slit in the top of each egg. Slip 2 slices of radish, offset, in each egg's slit, like ears. Using your toothpick, poke 4 holes in the "face" part of the egg. Push olive pieces into the top two holes and toothpick pieces into the bottom two. 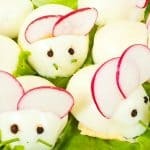 Serve those puppies, I mean mice, on a wet piece of lettuce and ENJOY! LOL! I really think you should try this recipe. And then hit me up with a comment on Facebook or here on the blog. 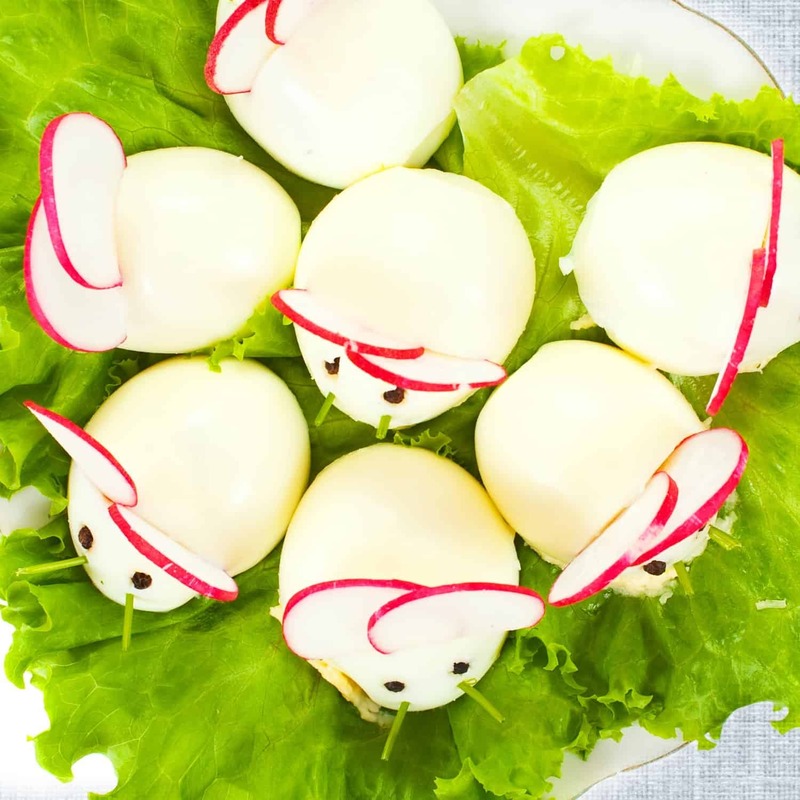 I mean, really, who doesn’t want to chow-down on the cuteness that is Mouse Deviled Eggs?! Heh.